The Tao of Gini: Take the money and run. You know that saying, right? You are in the store and someone gives you back too much change? You take the money and run. the item is short a couple of screws, but you don't tell the new owner. yah, like that EVER happens!!! TAKE THE CHAIRS AND RUN. They were set aside and said S.O.L.D. Now prior to seeing them, I didn't know I wanted them. I HAVE TO GO RIGHT TO INDONESIA WHERE THEY ARE PROBABLY MADE. All night long, I can't get them out of my brain. going to drive to the Home Goods ON THE OTHER SIDE OF THE VALLEY. typically don't "drive across town". I begin my mission. remotely like what I want...dammit. 11:30 right down the street from the original Home Goods I visited. chairs down into the store see if there by chance were anymore. the other one before I race at lightening speed back to get it. sure these aren't sold?" "I'm pretty sure we sold these yesterday." And I explained to her that I indeed pulled them out of a display in the back. and got the heck outta there. I just knew I had to leave fast. So the room is partially done. More pictures to follow when I actually finish it!!! Go ahead - say it. The room looks gorgeous!! 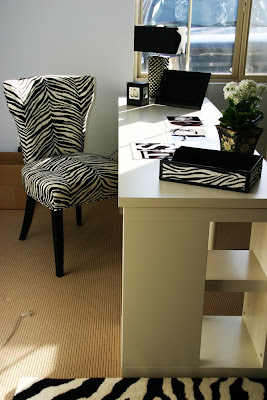 LOVE the zebra prints! Nice chairs! Very cute. I like your little man receptionist, too. Those chairs do rock. Great room. Oh, Allison. My heart sank when I read the "very cute" comment. Tell me how to un-cute this room (besides taking Garrin out) because I am afraid Bill will not feel like coming in here! Cute is not what I am going for - HELP! Way to persevere with the chairs. 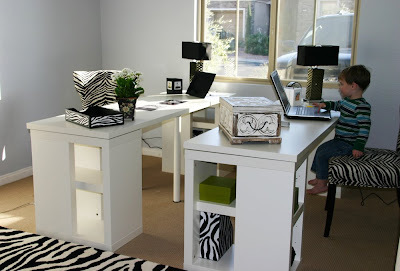 A great twist on an office/sanity room. It is spunky and fun and I think it does ROCK! No worries Gini, definitely not cute (no offensive Allison). Hip, swank, mod, those are the words I would use to describe it. 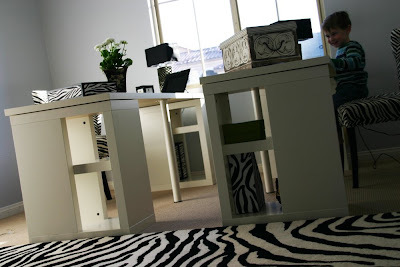 I love, love, love animal print. Can I come over and pretend to do stuff with you in your new fab room? We can look at each other and comment on each other's blog. The ATM did give Matt an extra $20 last week. It took him 2 days to finally find someone at the bank who would take it back! This room looks AMAZING, Gini!! Excellent job putting it all together - especially securing those chairs!! Gini- I am VERY impressed with your decorating skills and think the chairs/rug look awesome! Whoa, S O R R Y . . .
how about chic, urban, swanky? I am sure Bill will be right at home with the animal prints, but I thought he was more of a leopard man, myself, tee hee. Wow! Awesome room! I would have driven across town like you did... and I also would have prayed to the Chair God. We're a lot alike woman! I thought I was the only psychotic shopper who would journey across town to another store to find what I must have!!! Those chairs & the office look great....loved the comment about the cashier!! !